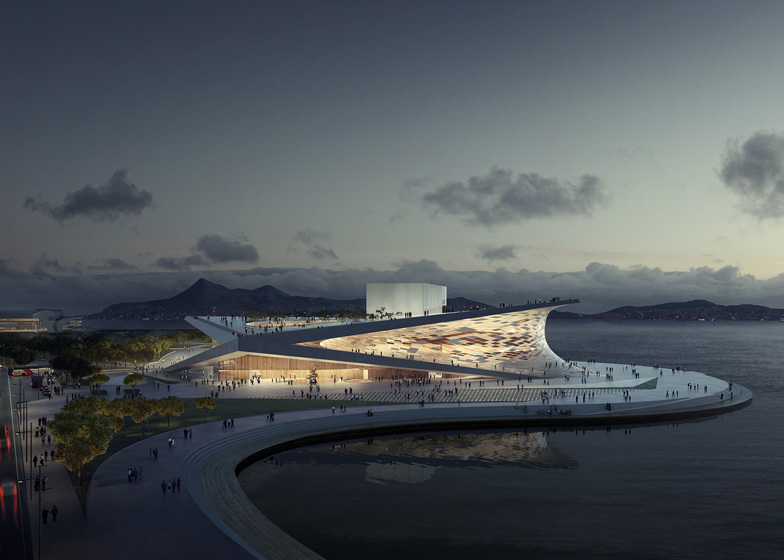 News: Norwegian studio Snøhetta has won a competition to design a waterside opera house in Busan, South Korea. Just like the celebrated opera house the architects designed in Oslo, the proposed building will have a slanted roof that extends down to meet the ground, allowing visitors to climb up to a rooftop public square. Here, marble panels will cover the ground surface and a rooftop restaurant will offer a view towards the mountains. The curved walls of the building will be glazed and lifted at two corners to create entrances on opposite sides. The auditorium will be positioned at the heart of the building and will be lined with sound-absorbing cherry to enhance acoustics. Other proposed spaces include a foyer, a function room, a VIP room, rehearsal rooms, a restaurant and a staff canteen. The Busan Opera House is set to open in 2018. Read about the Oslo Opera House by Snøhetta in our earlier story or see all our stories about Snøhetta. The Opera today not only represents our cultural identity, much more than that, it is there to form, shape and create our growing cultural awareness and manifestation. We set increasingly stronger demands to the institution; it is no longer just a passive playground for the elite but can become interactive, democratic, giving as much as it takes, responding to our ambitions and expectations. The Opera house can become the most essential cultural expression that we have in our developed urban societies. The Opera in Busan is a place to meet, a place to be together in our common cultural context. The Busan Opera house relies on our current experience of contemporary opera buildings, including the interactive attraction of an open and inviting typology. Some of the functions, especially its one level and horizontal functional layout is based on Snøhettas experience of designing easy flow and communications within such a building. The form of the Busan Opera house is derived from its own context and culture. The basis for the lay-out refers to Kun (Heaven) meeting Kon (Earth) which again meet Kam (Water). The classical trigrams of these elements both describe this site exceptionally well, whilst they refer to the historical and philosophical relationships that are of great importance to Korean culture. The slight bending of the surfaces in Snøhetta's design are the bars of the trigrams slightly deformed to touch and meet each other in a subtle manner. The geometry of the building consists of two opposing curves. The lower arching curve bridges the site and anchors the project in the ground. The upper embraces the sky and the Opera is created within the interplay of these surfaces, where the earth touches the sky and the mountains touch the sea. The four corners of the building connect the city and the cultural landmark to the sea. Two of these corners are lifted to form an entrance from the city and an entrance from the sea. These entrances are linked in a continuous public space, flowing around the Opera house and out into the public plaza. The upper plane is lifted on the opposite diagonal to accommodate the programmatic volume and to create an exterior plane that both arches down to the City and the sea at the same time as it peels upwards to meet the sea and the sky. The compactness and sustainable elements of the project have great importance on economy, sustainability and long-term maintenance of the building. Building upon the typologies we have previously developed in Oslo the Opera in Busan is changing earlier perceptions of the relationship between opera institutions and its users and the public. By designing an open, inviting and participative building typology, Busan will mark the entrance into a new era of global contemporary architecture reflecting today’s values of equality and democracies, effectively contributing to civic and cultural life on a broad level. Snøhetta will remain loyal to our contextual and landscape oriented designs also in the future, because we believe this typology to be the most relevant connector between a contemporary public and a contemporary architecture. Soft wrapping: Spanning between the two public planes and enveloping the public functions is the soft flowing skin, offering protection and transparency to the foyer within and linking the ground plane to the roof plane in an unbroken movement. The facade is constructed of panels of glass and marble supported on a two way system of cables spanning between the upper and lower surface. The glazed panels allow for transparency and view in the more vertical sections. The Marble panels form the pedestrian surface rising to meet the roofscape above. Auditorium: The Opera hall is conceived as a musical instrument. Precisely formed to resonate with the operatic acoustics and resonance. As with the foyer wall the auditorium is to be constructed from solid panels of Cherry wood. The less reflective and with deeper tones, these continuous surfaces envelope and surround the public in an ever changing weave of surfaces, designed precisely to reflect and resonate with the performance on stage. The choice is made for solid materials to maximise the acoustic performance. Particularly the side walls and balcony fronts change in profile and angle to best reflect and resonate with music and performance. Centrally placed above the Parterre is the main lantern. Not in use during performances, this provides an ambient light before and after performances. Roof Level: The upper surface is a plane of reflection and contemplation set apart from the bustle of the ground. Open and accessible to all, the roof level enjoys un-rivalled views to the mountains and the ocean. This marble surface, punctuated by a grove of flowering trees is the setting for the Fly Tower Restaurant. Level 4: The top level is dedicated to the administration. These areas enjoy views out to the rooftop atrium garden and direct vertical communication to both the Front and Back of house areas. In front of house there is a public access to the second balcony at this level. Level 3: This level houses the Academy, rehearsal rooms and staff canteen. This allows for the contact and synergies between the rehearsals areas and the Academy. Direct vertical communication links these areas with the performance space, support areas and changing facilities. Level 2: Here you find the VIP room. This level provides public access to the first balcony and is the location of the balcony restaurant and bar. Level 1: This level is the location for the Function room. These facilities enjoy the views out over the foyer and direct access to the first balcony seats. Level 0: This level is the location for main front of house foyer, restaurant and public entrance to the Parterre. The foyer space wraps around two sides of the building towards the sea. The foyer is entered either from the city side drop off, Parkside or from the Seaside board walk. The foyer provides entrance to all the main public facilities. The main conference hall provides a flexible space that can be utilised for all conference and banquet activities, as well as providing a 2nd stage option with flexible seating and stage possibilities. At level 0 Back of house contains the large rehearsal rooms, performance support, stage, stage making areas. All areas are connected to the main back of house corridor, loading dock and staff entrance. Level -1: Back of house these levels are the location for the dressing rooms and orchestra rehearsals room. All areas connect directly by vertical communication to the stage and performance areas above. The Exhibition centre is located on this level with a direct entrance to the main foyer above. The public cloakrooms and toilets are located at this lower level.